So you’re with your squad and you snap a wide selfie for Instagram. Everyone looks terrific, but you see issues. Dental issues. See, you’re smarter than average. You recently read this piece on why your dentist should be a key player on your crew. And that showing up for a checkup and professional cleaning twice a year just has to happen. You get that stellar teeth matter. In fact, you just saw on your Facebook feed that British researchers discovered how one smile stimulates the brain as much as 2,000 chocolate bars. That’s a lot of stimulation. So you quickly do the math. Bottom line: All those smiles in your group pic turn into a boatload of Snickers. 1. Short, thin front teeth. Alright, you won’t figure out what’s happening here without your dentist. But stress is brutal. Night-time grinding of your teeth aggravated by stress is way too common, and it can wear them out. Acidic sports drink erode teeth and destroy precious enamel. Difficult to get it back once it’s gone. Whatever’s behind the destruction needs to be uncovered. 2. Dull, yellow teeth. So a double tall mocha gets you going every morning, but teeth love to soak up the color. Over time, pearly whites turn into caramelly yellows. Fortunately, professional whitening is predictable, safe, and efficient. Using quality products from socially-conscious brands serves everyone well. 3. Dark shadows between teeth. You know that double tall mocha? It’s sporting about 15 teaspoons of sugar. Red Bull? North of 12 teaspoons. The bacteria in our mouths craves that sugar. They use it to make energy, then dump their acidic waste on your teeth. Holes form and hollow out dark areas in your enamel. Definitely get those checked. Small cavities don’t hurt, but big ones can explode with pain and swelling. And they just look nasty. 4. Red, swollen gums. This means there’s a bacterial partay going on in your mouth. And it could indicate that you’re starting to lose the bone around your teeth. Dentures aren’t all that cool, and gum disease is the main reason dentists make them. Teeth get loose, abscess, and have to be taken out. Not good. You can prevent this, especially when you’re young. But you’ll need to partner with the dental pros to put the brakes on it. 5. Too much pink. There’s nothing wrong with nice-looking gums. But if you see too much in your pics, and it bothers you, your dentist might be able to help. 6. Crooked or spaced-out teeth. Gnarly doesn’t have to describe your teeth. Or if gaps are traps for your sandwich, it might be time to get them all in line. Fortunately, invisible wireless options make orthodontics way easier than in years past. Check it out. 7. One gray tooth.If one tooth jumps off the screen on that close-up pic, it needs to be examined. See, a tooth that took an elbow or a bump years ago might seem ok. But if it’s darker than its neighbors, it usually means the nerve died and there’s a low-grade infection in your jaw. Not good again. Your dentist can quickly help you figure out what’s happening there. 8. Breath that reeks. Alright, so you don’t actually see this in the selfie. But when everyone leans in, the picture quality definitely tanks. To give yourself a whiff, floss your teeth and take a deep sniff. Not so good, huh? Bacteria stinks. The gasses and toxins they make don’t help the social scene. It could indicate a serious problem or just one that needs a little extra help to eliminate. Your dentist will figure it out. Dental health is all about you being well and looking terrific. While most problems in our mouths happen slowly, they eventually reach a critical stage. The struggle is real, but it’s worth it to keep a stunning smile. So if you see any of these clues or have other concerns, be sure to get in for a visit. 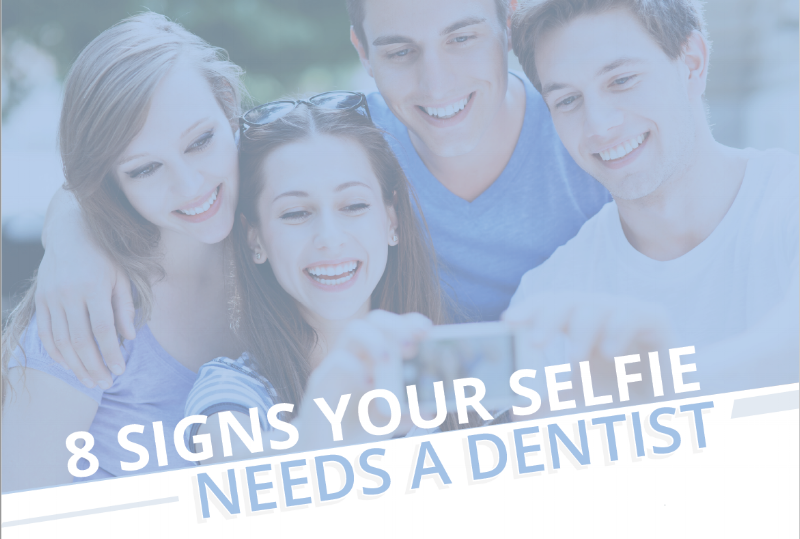 Your dental doc is instrumental in keeping post-worthy selfies flowing!